Wash then boil the yams with their peel on until they are tender. Let the yams cool and them remove the peel. Cut each yam into four to five pieces and arrange the pieces on large baking dish. Pour the orange juice over the yams and then sprinkle the orange zest on top of the yams. Sprinkle the yams with brown sugar and dot the tops with butter. Top the yams with marshmallows and then place orange slices on top if desired. 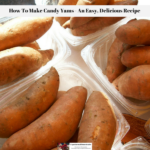 Bake the yams for 20 to 25 minutes at 350F until marshmallows melt.